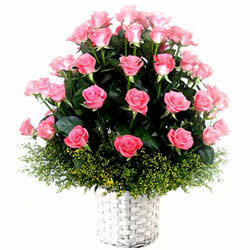 Send this exclusive gift of Delicate Pink Roses Arrangement to your dear one and express your love and affection. This undeniably stunning Bouquet holds 2 Dozen Pink Roses. Send this exclusive gift of Delicate Pink Roses Arrangement to your dear one and express your love and affection. This undeniably stunning Bouquet holds 36 Pink Roses.